The Arenal Volcano, located in north-western Costa Rica, about 90 km northwest of San José, has been one of the ten most active volcanoes in the world until recently. Measuring 1,633 metres (5,358 ft), it is conically shaped with a crater spanning 140 metres (460 ft). As one of the youngest and historically most active volcanoes of all the mountains in Costa Rica, it had remained largely unexplored until the 1930s, with the first documented expedition taking place in 1937 to reach the summit. It's volatile history sits in contrast to its current calm demeanor. In July of 1968, a powerful eruption destroyed the west flank of the volcano, forming three additional craters. The town of Tabacón was buried, killing seventy-eight people. Major eruptions throughout the 1980s and 90s have caused avalanches and heavy destruction of the vegetation along the Tabacón River and much of the green forest in the vicinity. In May of 1998, a 500-meter-long fissure ripped open the wall of the crater to a depth of 10 meters, causing material to slide down the side of the volcano. 23 eruptions were recorded in one day during a 7 hour time frame. Currently, the volcano is quiet. But the western flank is caving in- a phenomenon that is yet to be understood. Dr. Andrew Newman of the Georgia Institute of Technology led a team of seven to deploy a broad range of methods to evaluate the stability of the flank. 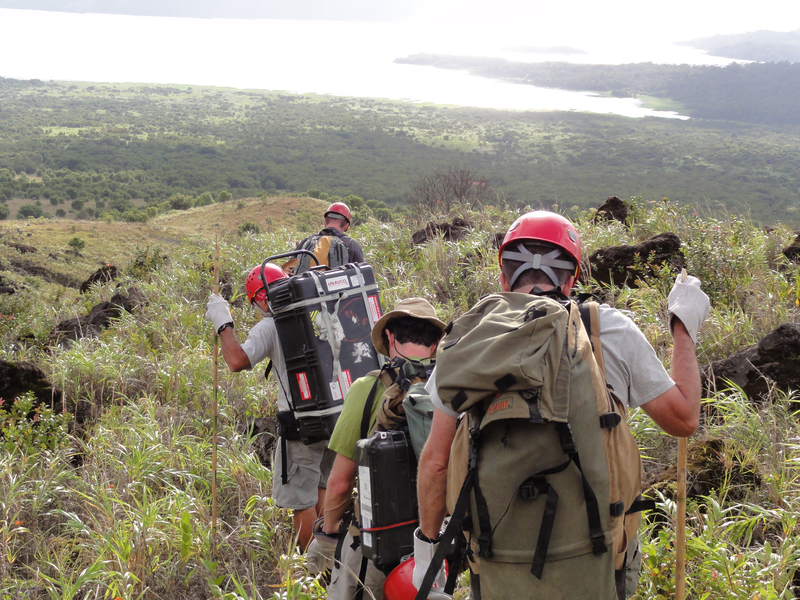 Instruments included GPS, InSAR, and repeat TLS measurements that will provide new data to combine with previous data sets to test a range of models attempting to explain the behavior of the volcano. 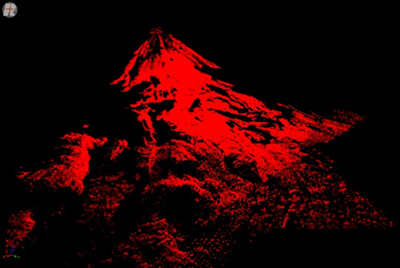 A Reigl 620 Terrestrial Laser Scanner operated by Jim Normandeau, Project Manager of UNAVCO, was used to scan the western flank of the Arenal volcano. 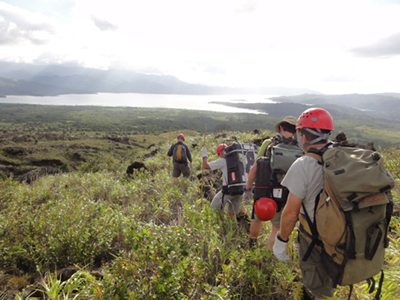 The field team of seven (from Georgia Tech, Obvservatorio Vulcanológico y Sismológico de Costa Rica, and UNAVCO) got up early each morning to hike up the flank of the volcano and set up new scan position each day. Due to size of area of interest, it took all day for to complete a successful scan for one position. By the end of project, 5 scan positions were completed and all data were merged into a Georeferenced Point Cloud (see Figure 3). In addition, the field team re-occupied five campaign GPS sites, upgrading one to a continuously operating station. Figure 3 - Millions and millions of data points on the Arenal Volcano.